Lets face it, George W. Bush has been a far better ex-President than President. And if you have a heart that is still beating, it is very hard not to fall under Michelle Obama’s spell. In any event, the two couples have tried to exemplify what Politics should be in this country. Maybe it was the unexpected warmth of the gesture, the sheer enveloping display of affection. Maybe it was his response, the beatific expression on his face, eyes almost closed, head tilted toward her shoulder. Maybe it was the moment: tenderness at a time when presidential politics has become a festival of cruelty. 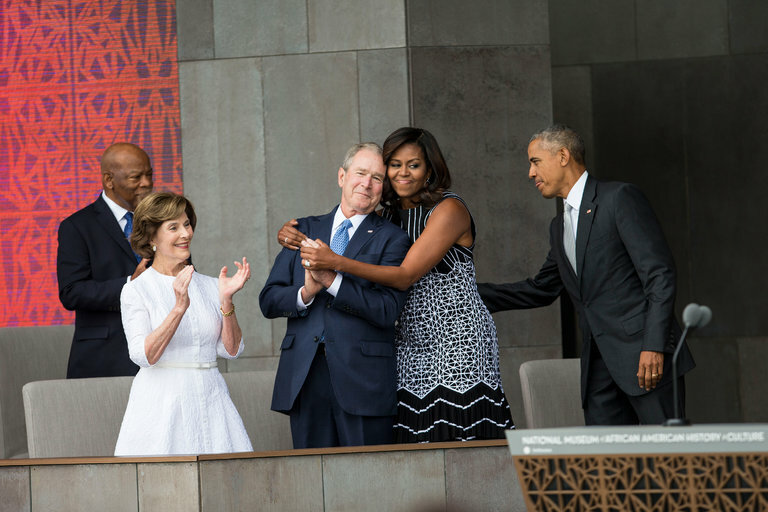 But when Michelle Obama hugged former President George W. Bush on Saturday, at a ceremony to open the National Museum of African American History and Culture, the image quickly took flight online. However one chose to interpret it — and overinterpretation is a hazard in such exercises — it became an instant metaphor. Some saw the lost virtue of civility in politics; others, the unlikely friendships that blossom at the rarefied heights of public life. To critics on the left, it was a shameful case of political amnesia by the wife of a president who spent years cleaning up the mess left by his predecessor. Mrs. Obama and Mr. Bush have had a few such memorable moments. In July in Dallas at a memorial service for five police officers killed by an Army veteran, the two held hands while singing “The Battle Hymn of the Republic.” When Mr. Bush began swaying to the music, Mrs. Obama gamely let him swing her arm back and forth. At one point, as the choir sang “glory, glory hallelujah,” he turned to her in a burst of enthusiasm, causing the first lady to crack up, despite the solemnity of the occasion. 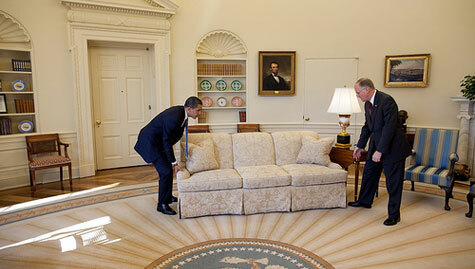 In June 2012, when Mr. Bush returned to the White House for the unveiling of his official portrait, he aimed a few wisecracks at President Obama. But he saved his best material for Mrs. Obama, reminding her that when British soldiers set fire to the White House in 1814, another first lady, Dolley Madison, rescued the portrait of the first George W. — as in Washington. Some of these encounters are explained by proximity. When the Obamas and the Bushes appear in public together, protocol dictates that Mrs. Obama stand next to Mr. Bush. Some of it is a function of the former president’s playful manner, which by all accounts has become more playful in his retirement. But some of it also has to do with the relationship between the couples, which current and former officials say has deepened over the past seven and a half years, both because of the shared bond of living in the White House and because of Mr. Bush’s decorum as an ex-president. 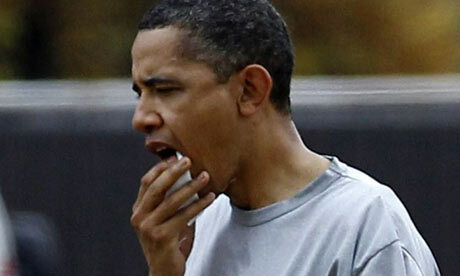 President Obama Requires 12 Stitches – The Real Reason! Well… That’s the official story. As for the guy on her arm, he’ll “definitely notice” what she’s wearing, says the first lady. Maybe to a fault: “Sometimes it’s a little irritating. Because it’s like, ‘is that new? '” she says. “It’s like, well, well—stay out of my closet!” The president tells Walters “I’m not rifling through” her closet, but adds that Michelle “looks good, generally. For saying your Lady “looks good…Generally”?